Seven Palestinian protesters were killed and about 257 persons were injured by the Israeli military during the Great Return March demonstrations on Friday, 28 September 2018 in the Gaza Strip. Among those injured were 33 children, five women, four journalists, and one paramedic. 163 of the injured were shot with live fire, including 20 children and one woman. At around 5:55pm, Iyad Khalil Al-Sha’er, an 18-year-old resident of Shujaiya neighborhood in east Gaza City, was pronounced dead ten minutes after he was shot with a live bullet in the chest. He was shot while attending a demonstration in eastern Gaza City. 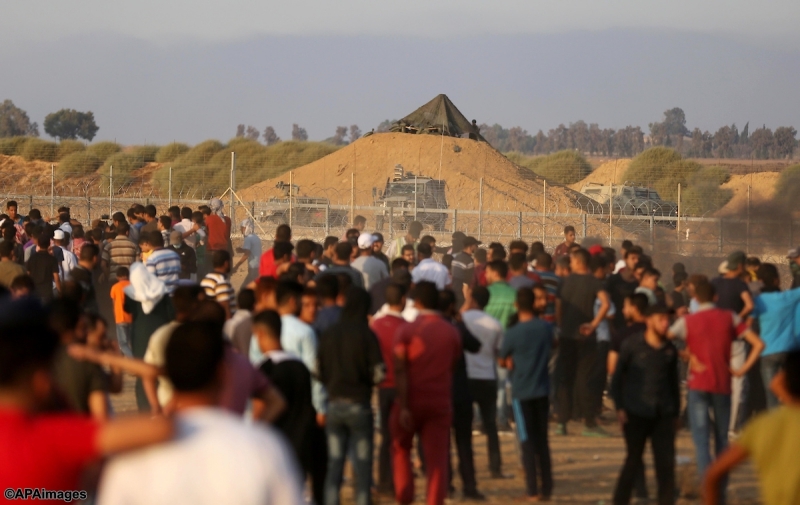 At around 6pm, Mohammed Nayef Al-Houm, a 14-year-old resident of Al-Bureij refugee camp in the Middle Gaza district, was pronounced dead following his injury with a live bullet in the chest. He was shot at around 5pm at the demonstration in east Al-Bureij camp. At around 6:05pm, Mohammed Walid Haniya, a 32-year-old resident of Al-Sheikh Radwan neighborhood in Gaza City, died of wounds he had sustained ten minutes earlier. He was shot with a live bullet in the face while at the demonstration in eastern Gaza City. At 6:20pm, doctors at Al-Shifa Hospital pronounced the death of Mohammed Bassam Shakhsa, a 24-year-old resident of Shujaiya. He was shot in the head with a live bullet while at the demonstration in eastern Gaza City. Shakhsa was shot ten minutes prior to the announcement of his death. At 7:10pm, Mohammed Ali Inshasi, an 18-year-old resident of Al-Amal neighborhood in Khan Younis city in the south of the Gaza Strip, was pronounced dead following his injury with a live bullet in the stomach. He was shot at around 6:50pm while at the demonstration in eastern Khan Younis. At 7:20pm, doctors at the European Gaza Hospital pronounced the death of Naser Azmi Musabeh, an 11-year-old resident of Abasan Al-Kabira in Khan Younis. The child was hit with a live bullet in the head at around 6:30pm while at the demonstration in eastern Khan Younis. At 9:25pm, Mohammed Ashraf Al-Awawda, a 25-year-old resident of Gaza Valley, succumbed to chest wounds sustained by a live bullet at around 5:10pm while at the demonstration in east Al-Bureij refugee camp. -- Mohammed Jamal Abu Qadous, a 23-year-old journalist with Siraj for Media Services, was also injured by shrapnel to the head. The four journalists sustained their injuries while covering the demonstration in east Gaza City. Mohammed Fareed Al-Ammor, a 24-year-old paramedic with the medical services, was wounded with a live bullet in the foot while working in eastern Khan Younis. Al Mezan’s records show that from the start of the Great Return March on 30 March 2018, 203 Palestinians have been killed in Gaza, including ten whose bodies are being held by Israeli forces (two of them minors). Of the total number of fatalities, 151 were killed in the demonstrations, including 30 children, one woman, two journalists, three paramedics, and three persons with disability. Another 10,234 people were injured, including 1,849 children, 424 women, 115 paramedics, and 115 journalists. Of those injured, 5,814 were hit by live fire, including 939 children and 114 women. Al Mezan reiterates its condemnation of the use of lethal and other excessive force by the Israeli forces, including sharpshooters, to police demonstrations. Al Mezan stresses its condemnation of the continued attacks on children as well as on journalists and paramedics who are visibly marked as such by their clothing and gear. Al Mezan stresses that the right to peaceful assembly and free expression are fundamental rights and must be respected. Unarmed protesters not posing any serious or imminent threat to the Israeli forces must not be shot. The excessive use of force indicates a continuation of unlawful targeting practices on the part of the Israeli forces despite its legal consequences and international condemnation. Al Mezan urges the international community, led by the Parties to the Fourth Geneva Convention, to take prompt and effective steps to ensure respect for international law and provide meaningful protection for unarmed protesters and civilians throughout Gaza. The duty to protect civilians is a principal legal requirement and is, at this point in the conflict, a test of the authenticity of the international community’s commitment to their legal obligations, moral standards and humanitarian objectives vis-à-vis the Palestinian population. Al Mezan stresses its position that the failure to hold to account perpetrators of human rights and international humanitarian law violations encourages the advancement of harmful policies and practices. Al Mezan therefore calls on the international community to activate accountability mechanisms to ensure that violators are brought to justice in accordance with international law, including international criminal law. In this vein, the international community is called upon to support the UN Commission of Inquiry’s impartial and independent investigation into the apparent unlawful deployment of force against unarmed demonstrators, journalists and paramedics.